I must qualify that I am not 100% committed to this two-register cosmology, but the concept does seem to have merit, and it got my creative mojo flowing in an entertaining direction. I thought “I bet this is the death that scripture talks about in Genesis 3 when Adam and Eve ate the fruit – we died from the perspective of the upper register, and our life in the lower register was all that remained.” I of course immediately tried to picture what that would look like from an angelic perspective and… you guessed it. It looks like the zombie apocalypse! I myself have very little interest in the zombie apocalypse. I have not watched a single movie about zombies, or a single episode of the Walking Dead. (*That might be a lie… My husband might have tricked me into watching part of “Shaun of the Dead” when we were first married.) 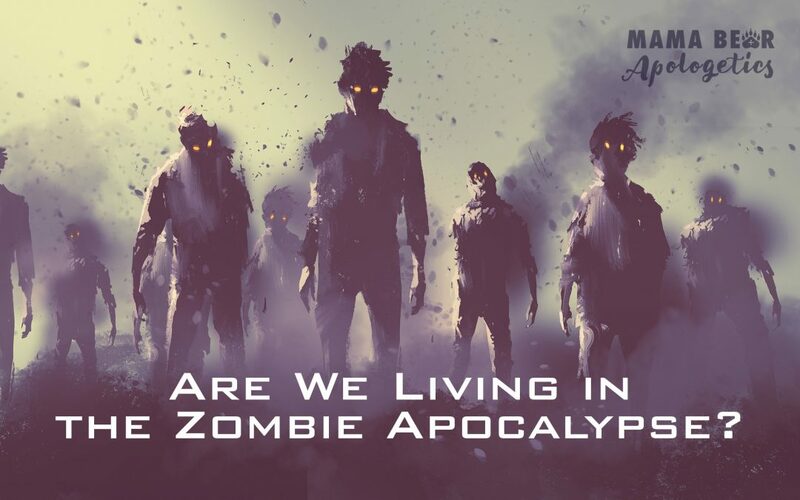 However, let me say one thing Mama Bears: if your child is fascinated with the idea of the zombie apocalypse, this is a perfect opportunity to address why society tends to gravitate towards certain themes. Ask them “Why do you think so many people enjoy talking about the zombie apocalypse?” Take them a step further and ask “Are there any truths in scripture that could help us understand why people are so drawn to the idea of a zombie apocalypse?” The bottom line is that people like talking about themselves, and they are drawn to themes that reflect their own reality in some way. The fact that we as a society ARE so drawn to the themes depicted in the zombie apocalypse is just proof that there are truths being depicted in this element of pop culture that resonate with the truths already written on our hearts. Have you noticed any other parallels between the zombie movies and scripture? I haven’t seen them (the movies,) so tell me about it in the comments! Hagopian, David G. The G3N3S1S debate: three views on the days of creation. Mission Viejo, CA: Crux Press, 2001, p. 237. Great article – I tend to think of some of the media themes and story lines hitting on some of the same story lines we see playing out in reality at times. I think John & Staci Elderedge do a great job of sharing story lines that happen. I have a hunch that stories dealing with supernatural/mystical beings can reflect reality right now. For example, I work with and know some people who are drug addicts – and the drugs literally eat their minds/thinking capacity and create threats for others around them. I also work with victims of abuse – how the abuse literally consumes their thoughts, actions and takes over their bodies? It is painful to witness and watch and at times can give way to feelings of helplessness. How often do children and people around us have that looming threat hanging over them? And I wonder how we can minister to the people around us who are living in their own “Zombie Apocalypse”?